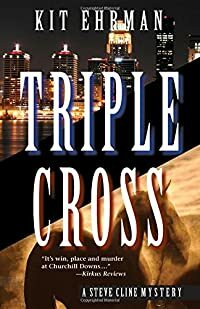 Triple Cross by Kit Ehrman, a Mysterious Review. Review: Horseman and amateur sleuth Steve Cline travels to Louisville for the Kentucky Derby in Kit Ehrman's fourth entry in this series, Triple Cross. Steve has been asked by his father, trainer of a Kentucky Derby entrant, to help out in the preparations for the race. He arrives in Louisville a week prior to the first Saturday in May, splitting his time working on the track backside and fulfilling an assignment for a private investigator course he's taking: finding out as much as possible about a random individual. The person he chooses, a woman working as a marketing assistant on the frontside, inexplicably disappears after he meets her and is subsequently found murdered. Since Steve was investigating her background, he seems a natural suspect for the police. But when Steve later escapes some close calls himself, he realizes she may have been involved in something far more dangerous than he ever imagined. The first half of Triple Cross, which proceeds at what might best be considered a leisurely pace, is largely background material for the plot which itself is fairly complicated. The title, no doubt a play on racing's Triple Crown, intimates that a "triple cross" will be revealed at some point necessitating a complex set of relationships to be set up early in the book. Horse racing itself has numerous participants: owners, trainers, jockeys, and other assorted horse men and women. The owners typically have other business interests as well, offering any number of plot possibilities. Ehrman initially does a fine job of managing all this information in Triple Cross, but seems to falter when attempting to introduce misdirection, red herrings if you will, into the story. It's a bit confusing at times, and the plot gets sidetracked for a while but eventually regains its focus. And, as with a typical horse race, in the end it all comes down to the stretch run. In this regard, Triple Cross is a winner. Acknowledgment: Poisoned Pen Press provided an ARC of Triple Cross for this review.